Getting to Maybe: NICE BUNS! 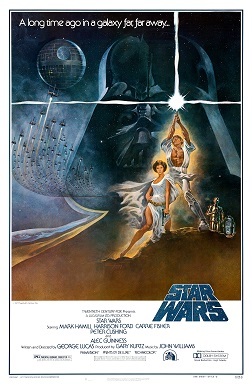 Friday will mark the 30th Anniversary of the release of the film STAR WARS. Now, I am not a huge science fiction fan; I'm no Dungeons & Dragons player obsessed with fanart and role playing. I am, however, a child of the 80's. I grew up with the heroics of Luke Skywalker and Han Solo. I was terrified by the evil of Darth Vader, and I swooned at the romantic ideals of the lovely Princess Leia. The films are classic. They aren't the high tech schlock that Lucas has since produced. Rather then trying to woo audiences with the glitz of big budget special effects, these films are old school stories. They won us over because of their simplicity. At the heart of the STAR WARS legacy is the story of a battle. It is the battle of Good vs. Evil. It is the battle of Luke to find his true identity and discover his past. It is the battle of Han Solo to fight his womanizing ways and eventually win the heart of the lovely Princess Leia. And, it is the battle of Leia Organa to wow us with her top notch 'dos. What child growing up didn't marvel at the engineering genius it must have taken to create the elaborate swirls of Leia's updo? What little girl (or gay boy) didn't don a towel on her head and try to twist it into those ubiquitous braids? 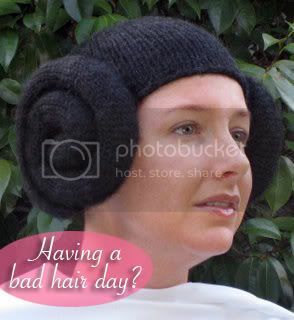 Who didn't look into their mirror only to think "if only my hair were a bit more Leia-esque"? Well, for those who ever wanted that intergalactic babe look, search no further! Just in time for the 3oth Anniversary Celebrations, you can create your very own Princess Leia Wig! That's right! Some crafty genius has devised a pattern to allow you to knit your very own Princess Leia Wig. With a few skeins of yarn, a couple of hours time, and an unhealthy passion for SciFi, you too can be the envy of the Rebel Alliance! And what, pray tell, does this wig look like? Here you go! Now, I just need to find someone who knits. Let me know if you can make me one! Lost Pre-Post: "Through the Looking Glass"
Lost - Season 3, Episode 21 - "Greatest Hits"